Find Out What Franchise This is By Clicking Here. SELLER WILL FINANCE UP TO 50% OF SALE PRICE ON APPROVED CREDIT!! Get in now to the hottest trend in restaurants, the healthy eating trend. This is a trend that is not going away the healthy eating lifestyle is here to stay are you ready to profit from it? This is a booming franchise restaurant built out by the area developer, so you know it was done right. Expected build out cost (from the franchisor) for a restaurant in this franchise is 420k. Seller spent 419k! This place is a bargain, seller wants to expand the local market and is willing to sell this outstanding location at a loss. Downtown San Diego Restaurant Location is perfect for this concept. Located in the middle of Downtown San Diego with the tallest buildings in the city as your immediate neighbors. Catering opportunities are enormous. The restaurant has huge visibility to passing vehicle traffic day and night. Free advertising all night long with the bright interior signs and huge windows. 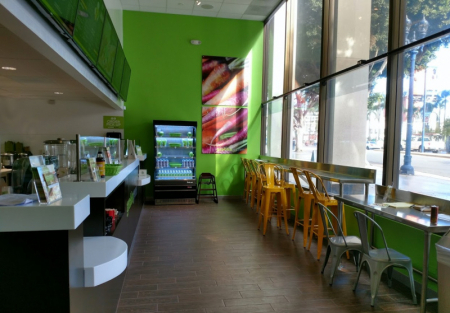 The foot traffic is even better, large floor to ceiling windows provide constant advertisement to everyone passing by and who doesn’t want to stop in for a healthy meal, smoothie or snack? This super clean restaurant space is literally like new, approximately 1450 Sq. feet and built out exactly as the franchisor requires. You can get this successful franchise well below the cost of coming in to an empty shell and building it out yourself. Even better is the goodwill that is being built up by the current operations, no down time here with planning, construction and sales build up. You will hit the ground running as you take over this popular and up trending franchise location. Go See this Restaurant Franchise by Clicking Here. Lock up this location for 18 years as the lease expires Feb of 2025 with three options of two, three and five years. Current rent is $ 6,735/month. Rent includes CAM and more importantly SDG&E, trash and water, which is a HUGE savings likely to be about $1,500 to $2,000 a month, making the real rent only $4,235 a month. If you love the healthy lifestyle and are ready to run a business that promotes healthy living this is the place and franchise you have been looking for.